The long, lazy days of summer are the perfect time for kids to be creative: Cate and Levi‘s make-your-own puppets or stuffed animal kits are an awesome, eco-friendly activity from a company with a conscience. Cate and Levi’s products are handmade in Toronto with materials being sourced as close as possible to the owner’s studio. The toys and puppets themselves are made from reclaimed wool, and each kit also comes with a needle and thread and instructions. Cate and Levi’s maker kits proudly support a zero-waste policy: the tube or box that the materials come in transforms into a display or a home when your child is finished. Kids can choose from a dog, monkey, unicorn, or giraffe puppet kit or a dog stuffed animal kit. These colorful, cuddly, one-of-a-kind creatures will make appearances in puppet shows, bedtime stories, and perhaps as dinner guests for years to come. The long, lazy days of summer are the perfect time for kids to be creative:�Cate and Levi's make-your-own puppets or stuffed animal kits�are an awesome, eco-friendly activity from a company with a conscience. Cate and Levi's products are handmade in Toronto with materials being sourced as close as possible to the owner's studio. 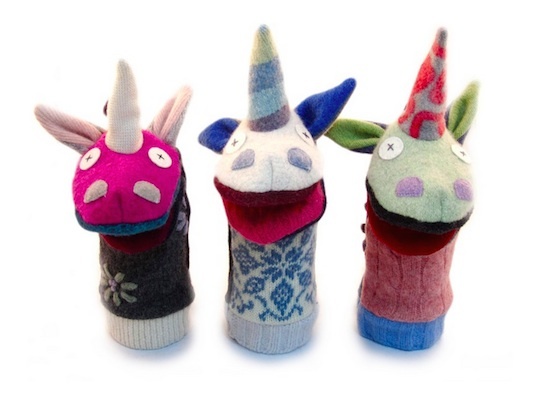 The toys and puppets themselves are made from reclaimed wool, and�each kit�also comes with a needle and thread and instructions. Cate and Levi's maker kits proudly support a zero-waste policy: the tube or box that the materials come in transforms into a display or a home when your child is�finished. Kids can choose from a dog, monkey, unicorn, or giraffe puppet kit or a dog stuffed animal kit. These colorful, cuddly, one-of-a-kind creatures will make appearances in puppet shows, bedtime stories, and perhaps as dinner guests for years to come.